Speckled throughout any community are the antique and collectible shops that offer old-world treasures for people looking to honor the past. Every now and then, however, you find a store like this one that is unique - not only in the products it offers, but in its approach. This is Valley Emporium in Carlton. This shop is the very epitome of cool, bringing together different wines, sweets and, yes, antiques to downtown Carlton. “We prefer carrying mid-century finds instead of older items. True antiques are 100 years old or older, but it’s the things from the 50’s and 60’s that are our best sellers,” said Valerie Anctil, one of the owners of the Emporium. The theme for the store is “Wine, Art, Cool” and it’s an apt theme. Lining much of the walls are original vintage paintings, from world-renowned artists to virtual unknowns. And there is a wide range of art styles for people to choose from. A teak statue from Bali sits in the same room as a painting from Creixams, a Spanish painter, and a nearly life-size fiberglass horse. “We’re pretty particular about what goes on the floor – we really have to find it interesting or unique,” said Jeff Lorton, Anctil’s business partner. But that isn’t all. Anctil was a pastry chef at the Paris Casino in Las Vegas and likes to work with chocolate and experiment, so she makes fudge that is sold in the shop as well. During the month of December there is a large gingerbread village on display that is made by Val and decorated by friends in the community. Valley Emporium is a great place to hang out, learn about wine, visit with new-found friends and buy some cool items for your inner mod. And that is exactly how the two owners like it. If for no other reason, visit Valley Emporium to see the giant photograph of Sasquatch that hangs near the wine bar, a glass of wine clutched in his furry paw. “We enjoy meeting people from all over that come through the door,” Lorton said. 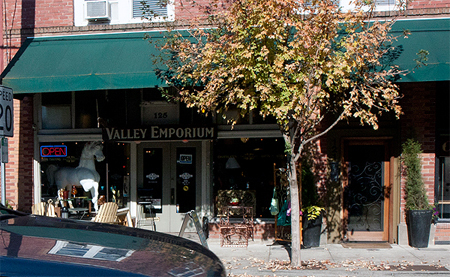 About Valley Emporium: A 1,000-square-foot wine, sweet and vintage shop in downtown Carlton. They offer vintage art and other items from the 1930s through the 1960s and also have wine, sweets and a wall of brochures about tourist activities around Carlton and Yamhill County. What to bring: This is inside so bring your sense of adventure and willingness to talk with the owners. They can give you some great advice on what to see and where to go, and also excellent suggestions about local area wines. Tip: Give yourself some time to go through the store. I looked around for about 45 minutes and each time I made the rounds I noticed something new. It’s a great place to stop and relax a bit. Season: The store is open year-round. Getting there: Valley Emporium is located at 125 W. Main Street in Carlton. It is in downtown Carlton and very easy to find in between other shops and restaurants.